Remember the controversy that erupted back in 2005 when a Danish newspaper published a cartoon of the Prophet Mohammad? While there were nonviolent protests around the world, including a boycott of Danish goods, violent riots also broke out in many cities that left more than 100 dead. 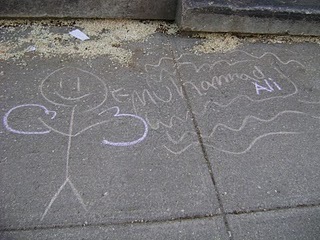 When the Atheists, Humanists and Agnostics association at the University of Wisconsin-Madison decided to defend the right of free speech by drawing stick figures of the Prophet Muhammed on campus sidewalks, the campus Muslim Students Association quickly responded. They followed the atheists on their blasphemous journey, and whenever a drawing of the Prophet Muhammed appeared, the Muslim students drew boxing gloves on the figure, and changed the name to Muhammed Ali. Confronted with satire, the Muslim students responded with humor (yes, you could say they desecrated the atheists’ grafitti, but grafitti artists are in no position to complain). You’ve got to hand it to them, it was a creative and non-confrontational way to minimize the intolerable offense of seeing stick figures labeled Muhammad. It was a celebration of free speech for everyone!